Let's quickly deal with the elephant in the room: yes, the Ascend Mate is comfortable to hold. Despite that massive display, it won't strain the average hand during a phone call. Huawei has trimmed the bezels enough that a 6.1-inch LCD is actually viable. At 6.5 x 3.4 x 0.4 inches (163.5 x 85.7 x 9.9mm) and seven ounces (198g), the phone isn't as big or heavy as you'd expect for something that lords an extra 0.6 inch of screen over its rivals. The power button and volume rocker on the right side are within easy reach, too. Think of the Ascend Mate as the efficiently designed Sony Xperia ZL, writ large. That said, there's no question that this behemoth pushes the limits of ergonomics, and not just in the hand. While it almost goes without saying that you need two hands to reach every corner of the screen, the phone isn't very pocketable, either. It fits into an average-sized jeans pocket comfortably, but with a conspicuous bulge; we wouldn't want to try the same feat with skinnier legwear. Who'd have thought that 5-inch phones like the Galaxy S 4 would suddenly seem compact? No one will accuse Huawei of being a slave to fashion. The Ascend Mate's body is the definition of utilitarian: outside of the speaker and 8MP rear camera, the back and sides are dominated by matte plastic. While this makes the LG and Samsung alternatives seem like works of art, it delivers the sturdy grip that's virtually necessary for a phone this big. The soft-touch finish on our black model (there's also a white version) is pleasing enough in our palms. At the front, there's just as much austerity. You'll find a 1MP front camera as well as the requisite sensors and speaker, but it's largely a sea of scratch-resistant Gorilla Glass. All navigation takes place on-screen. It's best to go shopping for a microSD card almost immediately. Expansion and connectivity aren't quite as broad as we'd like. You'll find the micro-SIM slot and headphone jack at the top, a micro-USB port at the bottom and a microSDHC slot at the top-left corner. What you won't find is NFC, the Ascend D1 Quad XL's MHL video support or a lot of built-in storage. 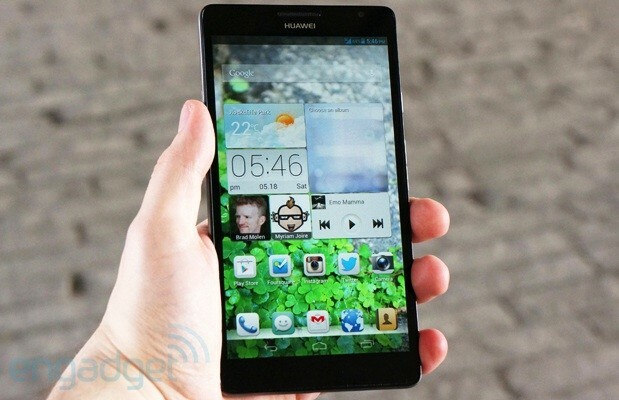 Huawei ships the Ascend Mate with just 8GB of flash memory built in, and only 4.68GB of that is accessible. We almost ran out of internal space within a few days of testing, and that was with just two (admittedly large) games, a handful of common social apps, 125 photos and three short 1080p video recordings. Unless your entertainment only involves streaming media and bite-sized games, it's best to go shopping for a microSD card almost immediately. And before you ask: no, there's no pen in the box, nor is there a pen-aware digitizer on the touchscreen. If handwritten notes are crucial to your workflow, you'll have to either make do with a third-party capacitive pen or shop for a Galaxy Note. The battery isn't removable, although we suspect that owners won't mind as much as they would with other phones. The Ascend Mate carries a gargantuan 4,050mAh lithium pack that makes even the Droid RAZR Maxx HD's 3,300mAh unit seem modest. We'll talk about the raw numbers later on, but it's safe to say that we didn't spend much time hunting for wall outlets. There's no wireless charging to let us skip the cabling entirely, though. This is why we're here, really. It's hard to convey exactly what a 6.1-inch phone screen is like to use: the Ascend Mate sits in a nether region between 2012's biggest smartphones and the smallest tablets. Software dictates that you control it like a phone, but the size encourages more tablet-like behavior patterns. Catching up with news on Flipboard? Marathon YouTube sessions? Both make far more sense here. We would gladly skip any smaller tablets if this phone were always at hand. This is a high-quality display, though not as good as we'd like it to be. It's a good thing, then, that this is a high-quality display, though not as good as we'd like it to be. 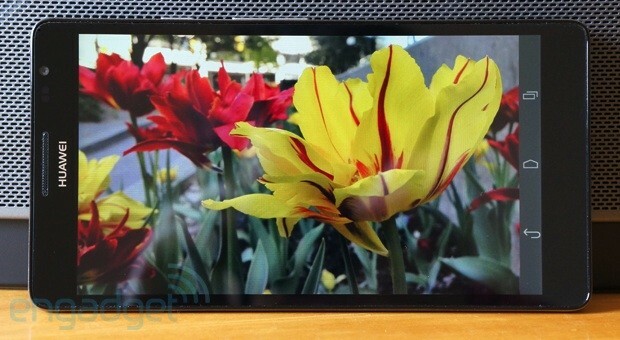 The IPS+ LCD has vibrant, yet well-balanced colors, without a conspicuous cast. Huawei lets fussier owners adjust the color temperature through a simple slider. Viewing angles are very wide, as you'd expect with IPS, although the picture dims slightly any time you're looking at the phone from off-center. Outdoor visibility is strong when the brightness is cranked up, and those of us in wintery climates will be happy to see a glove-friendly, high-sensitivity touch mode. However, there's no escaping that the Ascend Mate touts a 720p, 241-ppi screen at a moment when numerous smaller phones have made the leap to 1080p and over 440 ppi. You'll notice the individual pixels if you go looking for them, and you'll miss the print-like quality of phones like the Galaxy S 4, the One or Huawei's own Ascend D2 in those same moments. The Ascend Mate is mostly saved by the viewing distances that go along with such a big screen. Many won't hold the device all that close to their face, and we stopped focusing on the pixels after a short while. Still, it would be nice if high resolution and large size weren't mutually exclusive in the Ascend lineup. 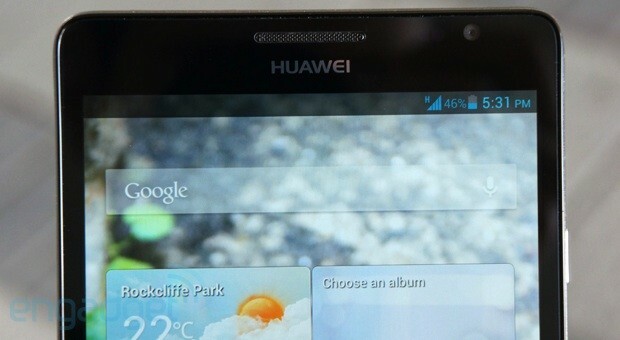 For the most part, Huawei's Emotion UI layer circa Ice Cream Sandwich was an exercise in minimalism. Elements like the custom lock screen, 3D Home and themes were enough to remind us that we hadn't picked up a Nexus by mistake, but the company mostly stayed faithful to Google's Holo interface concept, for better or worse. 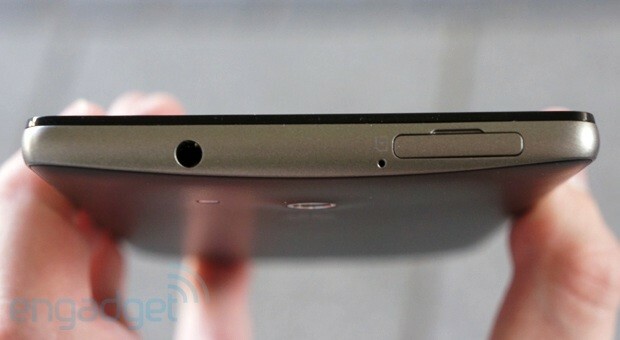 The Ascend Mate tosses much of that aside. While the phone makes a welcome upgrade to Jelly Bean (Android 4.1.2, to be exact) and brings both rich notifications as well as Google Now to the forefront, the matching Emotion UI 1.5 refresh is a drastic makeover closer to what we've seen from other Chinese vendors. Its overhaul begins with a new look: Huawei makes its own visual theme the default, and there's no going back. At least there's more sophisticated theming this time around. You can pick from any of 20 (!) 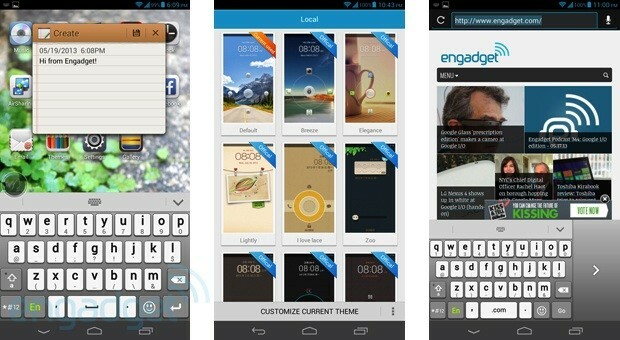 included themes, mixing and matching their fonts, icon sets, lock screens and sounds to your heart's content. The big cognitive break comes when you go looking for the app drawer: there is none. Similar to what we've seen from Meizu and Xiaomi, whatever's on your home screens represents every app you have, and removing the icons uninstalls the apps themselves. The iOS-like concept is easier to understand -- but it also means losing valuable screen real estate to apps that you may only use once in a blue moon. Huawei does go to some lengths to mitigate the effects by making space for 25 icons on each screen, allowing up to nine home screens and implementing an easy-to-use folder system. Nonetheless, it will require some housekeeping to prevent things from getting out of control. The big cognitive break comes when you go looking for the app drawer: there is none. Changes don't stop there, of course, and they're mostly positive despite that initial shock. After moving past the familiar shortcut-laden lock screen, you'll usually see the Me Widget. Picture it as a bento box for information: you can mix and match a group of Huawei-chosen widgets for clocks, contacts, music, photos and weather, all of which fit into a prescribed area. We made good use of it, although it's possible to remove the widget if it's consuming too much space. The notification bar has caught up to rivals with customizable settings shortcuts, and the multitasking view has a helpful "sweep" button that immediately quits every app. Other additions? There's an iOS-style Smart Reading component that lets users quickly search for words in Google, Wikipedia or a translator, while those tired of reconfiguring their phone for home and work have quick access to device profiles. A few of the Emotion UI updates are designed with the Ascend Mate in mind. You can opt for a smaller, one-handed dial pad or keyboard, for example. The mode is helpful with such a wide device, although the toggle is buried in the OS settings rather than the keyboard itself. Those determined to make the most of the screen can hide the navigation bar on demand. There are a few additions that fall flat. Easy Panel is a rough parallel to the mini apps we've seen from LG, Samsung, Sony and others, but it's rudimentary. The floating apps are limited to just a calculator and a notepad, with shortcuts to the regular Gallery and Messaging apps rounding things out. Curiously, we also can't launch Google Now from the navigation bar without first launching an app. Guiding Wizard, an augmented reality navigation overlay, appears to be entirely missing on our Ascend Mate; we've reached out to find out what happened. While the new Emotion UI has more hits than misses, it's apparent that Huawei is still learning the ropes of Android customization where its competitors are seasoned pros. Update: Huawei tells us that Guiding Wizard is only meant for China. Have you used the D1 Quad XL's cameras before? If so, you generally know what to expect with the Ascend Mate. The software hasn't changed much at all. Photographers can either stick to the default Smart mode or choose from several presets. Choose Normal mode and the software unlocks full controls for settings such as exposure, saturation and white balance. Huawei doesn't go overboard with camera features like HTC and Samsung, but it does have beauty, burst, group, HDR, low-light, panorama and smile modes. Most of these do their jobs as promised, albeit with conspicuous limits. The panorama mode produces a narrow 90-degree arc, and the HDR mode is better at bringing out objects in shadows than it is at restoring details in bright light. Smart mode occasionally produces odd results. The output itself is generally good, but not up to the level of the latest range-topping smartphones. The 8MP, backside-illuminated rear camera produces sharp daylight photos with a pleasingly soft background for close-ups, and both shutter lag as well as focus are reasonably quick (though not blindingly so). However, the Smart mode occasionally produces odd results. It tends to underexpose shots at times, creating what can best be described as a "burnt" look with exaggerated dark areas and occasionally muted or washed-out colors. Simultaneously, the camera tends to blow out the sky and other bright details. Low-light photography is also a glaring problem, as the camera can't soak up ambient light as well as the better mobile cameras we've seen. The front 1MP camera? It's merely serviceable, and won't challenge what HTC or Samsung bring to the table for resolution or overall quality. Video recording has seen a slight upgrade from what we found in the D1 Quad XL. You can shoot 1080p video at a more common 30 frames-per-second instead of the old 24.8, reducing eyestrain and preserving more detail in each frame. Image quality runs into barriers as with photos, although a healthy 24 Mbps bitrate reduces visual artifacts and leads to uncommonly pristine audio. Huawei still hasn't introduced support for tap-to-focus or simultaneous stills and videos, though. The several months between the last of the 2012 Ascend line and the 2013 batch haven't led to a big leap in performance. The Ascend Mate is once again running one of Huawei's own HiSilicon K3V2 SoCs, this time clocked at a slightly higher 1.5GHz. While it's a quad-core processor, it's still based on ARM's older Cortex-A9 architecture, rather than the newer A15 or a custom, in-between design like Qualcomm's Snapdragon range. Any improvement is more likely to come from Huawei doubling the RAM to 2GB; we had no problems juggling several apps at once. Unfortunately for Huawei, the competition hasn't stayed put since the K3V2 reached shipping devices. 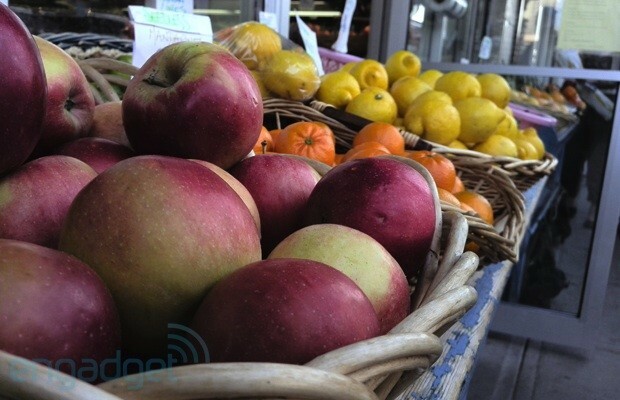 Samsung was just bringing the firepower of the Galaxy Note II's Exynos 4 Quad to bear at the time we reviewed the D1 Quad XL, and the LG Optimus G Pro has the luxury of an even faster Snapdragon 600. While Huawei wasn't necessarily hoping to beat LG or Samsung in raw performance, the generational gap is still a bit too obvious for our liking: what was once a top-end processor is now closer to a budget model. For a smartphone whose size is so conducive to gaming, the graphics are more than a little disappointing. The limitations are most visible in graphics rendering. That GLBenchmark result gives a clue as to what's in store, but firing up a few games makes it clearer. Although an older game like Riptide GP runs smoothly, an intensive title like Real Racing 3 stutters its way down to single-digit frame rates. For a smartphone whose size is so conducive to mobile gaming, that's more than a little disappointing. 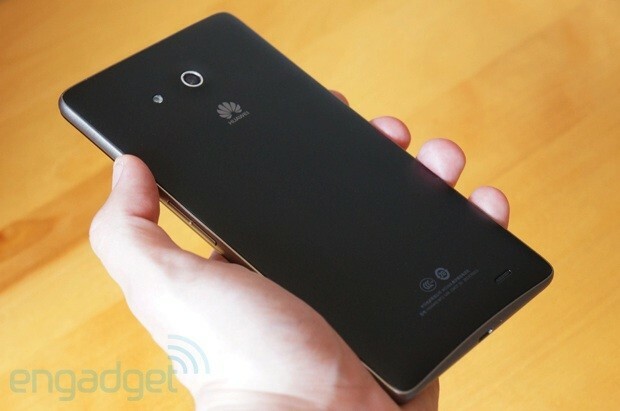 Ideally, Huawei would be shipping the K3V3 with the inaugural Ascend Mate, not its sequel. You might forgive that sluggish performance after seeing the battery life, however. Huawei makes exceptional use of that 4,050mAh battery pack, and you don't have to be miserly to see the full benefits. With the Ascend Mate in a normal power profile, we could loop a 720p video in stress test conditions (screen at half brightness; WiFi on, but not connected; social apps in the background) for a whopping 12 hours and 40 minutes -- one of the best results we've ever seen. If you're keeping score, that's two hours more than the Galaxy Note II and over five hours longer than the Optimus G Pro. The jury's out on the Galaxy Mega 6.3, although its 3,200mAh cell doesn't promise an evenly matched fight. Real-world testing is more impressive still. The Ascend Mate easily lasts through a full day of moderate usage with battery to spare, and four hours of extreme camera testing left the phone with just over half of its capacity. If there's a setback, it's the time spent powering back up. While there won't be much trouble returning to full capacity when using the proprietary fast-charging adapter that Huawei supplies in the box, a computer's USB port or a regular phone adapter can take north of four hours to do the same job. That said, we'd much rather have the luxury of charging a device slowly at home than be forced into a quick mid-day recharge at work. Cellular performance won't impress anyone. Cellular performance won't impress anyone, but we weren't expecting more when there's no trace of LTE inside the device. We received an unlocked, carrier-neutral Ascend Mate capable of 21 Mbps HSPA+ data on the 850 / 900 / 1700 / 1900 / 2100 bands, and managed a low, but usable average of 4.2 Mbps downstream and 2.1 Mbps upstream on Telus' network in Ottawa, Canada. Call quality on that network was merely adequate, both inbound and outbound; it wasn't exceedingly clear, but there were no outstanding complaints, even with background noise. Media performance is solid, if hurt by that missing MHL. No one will wax poetic over the built-in speakerphone, which isn't particularly loud, but they could be happy with the Dolby Digital Plus audio. Similar to Beats processing, its equalization software fills out the sound range on headphones. The default audio profile is a bit bass-heavy, but it's possible to choose a different sound or shut off the Dolby software entirely if it's overwhelming. External video is limited to DLNA media sharing when there's no MHL to lean on. At times, the Ascend Mate comes across as a two-sided smartphone. There's the would-be flagship, with a big screen and even bigger battery life. If you value those two factors above others, you may have found an ideal mobile companion: the Mate outperforms the Galaxy Note II and Optimus G Pro on both those fronts, and it may outlast the Galaxy Mega 6.3 on battery tests, too. The Ascend Mate breaks away from the pack on software. While we frequently prefer the stock Android interface, Huawei has shaped its Emotion UI into a truly unique and at times superior experience, as long as you don't mind that missing app drawer. The other half is classic Huawei: that is, it's a budget-conscious device that undercuts its pricier competition. For all of the Ascend Mate's outward trappings of greatness, it's really a frugal phone on the inside with an older processor, 3G-only data, modest storage and mostly recycled camera technology. That's more than acceptable for those who mainly care about battery life and screen size, but these design sacrifices prevent the Mate from being the best in its class. We also want to see how the Galaxy Mega 6.3 stacks up in comparison. After all, Samsung's incoming gigantophone has LTE, a 16GB storage option and a more mature (if sometimes criticized) software bundle. As such, the Ascend Mate makes the most sense if you can get one for a significantly lower price than its competitors. The good news is that you can, depending on where you live. As of this writing, a store like Expansys UK sells the Ascend Mate for £335 ($508), a full £110 less than the £445 ($674) Galaxy Note II. In Huawei's native China, it's an even cheaper ¥2,688 ($438). Americans won't save as much over a Galaxy Note II (it's just a $55 difference at Expansys), but the phone is still one of the least expensive in its category -- especially if you're measuring the cost per screen inch. We've come to enjoy using the Ascend Mate, but we also accept that it's a specialized tool, not a jack of all trades.